Dolomite is a very common mineral and is best known for its saddle-shaped curved crystal aggregates. A unique, isolated Dolomite occurrence in Eugui, Spain has provided colorless transparent crystals that resemble the Iceland Spar variety of Calcite, and have no resemblance to Dolomite specimens from any other localities. The occurence of Kolwezi, in the Congo (Zaire) has produced some fascinating, cobalt-rich specimens that are a beautiful hot pink color and are extremely popular. 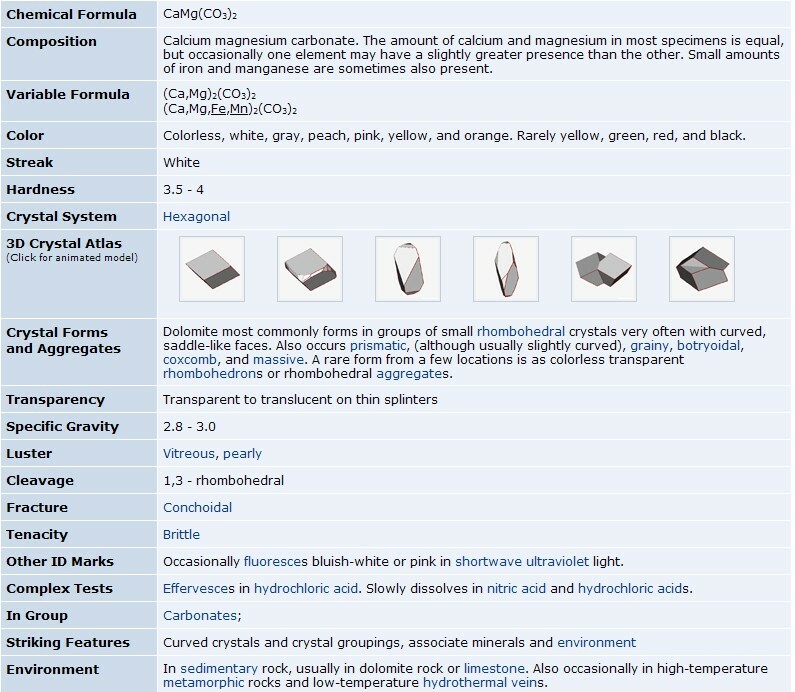 Dolomite occurs in a different crystal class than the Calcite Group. This can be noted by the fact that Dolomite generally forms more elongated crystals than the Calcite Group. In addition, Dolomite never occurs in scalenohedral crystakss, whereas minerals of the Calcite Group do.